Lindsay Seddon is a physician assistant certified by the National Commission on Certification of Physician Assistants and licensed to practice medicine in the state of Virginia under the supervision of a physician. Lindsay is local to the Hampton Roads area. After graduating from Grafton High School, she received her Bachelor of Science degree from James Madison University with a major in Health Science and a minor in Biology. Lindsay received her Master of Science in Physician Assistant Studies (MSPAS) from the Medical University of South Carolina in Charleston, SC. She recognized her interest in dermatology during her clinical rotation in dermatology. She is a member of the American Academy of Physician Assistants (AAPA) and the Society for Dermatology Physician Assistants (SDPA). In her free time Lindsay enjoys playing the piano, traveling and spending time with family/friends. 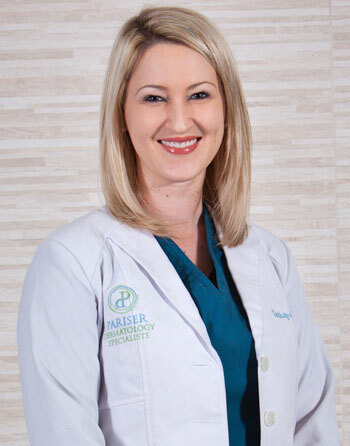 She feels it is important to educate patients about their skin and is excited to build relationships with her patients. "Lindsay Seddon has been my PA for several years, treating my two adult sons, daughter and myself. She has improved our physical appearance an emotional anxiety. Thank you!" "Mrs. Seddon was friendly and answered my questions thoroughly." "I think my provider is beyond Excellent! I even leave work early and take time off as well to travel to wherever she is at... That is how awesome she is." "Always very helpful and professional"
"Lindsey is absolutely wonderful! I only see her and have traveled to all 3 locations due to my absolute trust in her as a provider"